Did you have a good time compiling and filing your taxes last month? As much fun as I did, I’m sure. Most Americans agree (link to Gallup poll) that it’s time for a change to the tax code. T.R. 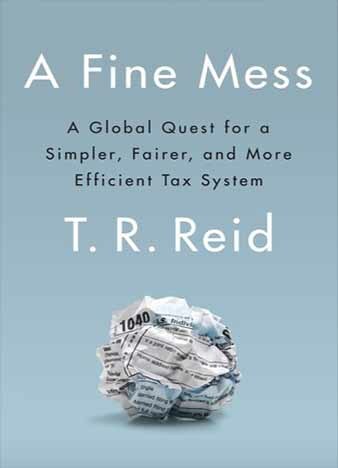 Reid’s A Fine Mess: A Global Quest for a Simpler, Fairer, and More Efficient Tax System (Penguin, 2017) breaks down the complicated subject of income taxation with a cursory global compare and contrast of other countries’ taxation efforts with those of the United States. This type of formula worked well in his previous effort, The Healing of America (Penguin, 2009), exposing America’s inefficient and disjointed healthcare system. Reid invites us to see how other countries do healthcare and taxation and asks: What best practices can we adopt to make our systems better? A bit of history: Property and consumption taxes (excise, duties, tariffs, and sales tax) have been around since colonial days. A temporary federal income tax existed during the Civil War. Corporations have been taxed since 1909. In the wake of the Second Industrial era’s Gilded Age, and its previously unrealized economic inequalities, the Progressive era birthed the federal income tax in 1913 via the 16th Amendment, empowering the federal government to tax Americans’ personal income. Only 4 percent of Americans – the country’s highest earners – paid an income tax that first year. I call the federal income tax the original inequality equalizer – those who had “the ability to pay” did so for the common good. It was only after WW II that a broader base of Americans paid federal income taxes. In 1927, Supreme Court Justice Oliver Wendell Holmes opined: “Taxes are what we pay for a civilized society.” As our bridges and rails and other structures deteriorate, a collective reset on our attitude about taxes could help. A bit of reality: Of the thirty-four richest countries in the world, as measured by the Organization for Economic Cooperation and Development (OECD) in 2014, the United States ranked thirty-first in taxes paid at slightly more than 25 percent of GDP. Only in South Korea, Chile, and Mexico is there a lower tax burden than in the United States. Reid also reveals that US government spending is comparable low at 15.5 percent of GDP, ranking thirty-second among OECD nations. Reid says the dual argument that Americans are overtaxed and the size of government is out of control is fictitious. More genuine would be for Americans to admit that our societal DNA – “no taxation without representation” – makes us skeptical about paying taxes. We prefer to do some things with private rather than public funding. Americans privately give more to social programs and charities (than do citizens in other countries), but none of these good works fixes bridges or roads or public structures. Reid explains that there have been major revisions to the tax code in 1922, 1954, and 1986. The mathematical symmetry of a significant change every 32 years targets 2018 as the year for the next reset to the code. While President Trump promotes a revision to the tax code as a major agenda item, a polarized and dysfunctional congress will make it difficult to attain. The 1986 revision – a bipartisan effort – was widely hailed as a needed breakthrough. Reid says other countries adopted its main thrust of slashing income tax rates for the highest earners. The code has since, however, been overburdened with loopholes, breaks, and complexities. Yes, it’s a mess. The majority of US taxpayers hire professionals to do their taxes, and Reid says that the “Tax Complexity Lobby” (Jackson Hewitt, H&R Block, Intuit, and others) strenuously opposes innovations like pre-filled tax forms that save billions of hours and fees for citizens of Japan, Britain, Sweden, Spain, and Portugal. Reid discusses three main options from his global survey: BBLR (broad based, lower rates), VAT (value added tax), and flat tax. The two main deductions needing elimination in 2018, according to Reid, are well-loved by middle and upper class Americans: the mortgage interest deduction (MID) and the charitable contribution deduction. Reid claims the familiar rationale behind the MID – it encourages home ownership – is now passé; other OECD countries without an MID have home ownership rates similar to ours (about 65%). Reid also contends that Americans will continue to support charitable organizations whether there’s a tax break for itemized deductions or not. His rationale for this latter assertion seems mostly to be personal opinion. I do strongly agree, however, with his overall assessment: “Like the charity deduction, the benefits for home ownership are strongly skewed to the richest taxpayers.” This turns out to be – let me use a loaded phrase to make a point – government dole mostly for the well-to-do to the tune of $200 billion in 2016, with three-quarters of the MID tax break going to households that make more than $100,000/year. Matthew Desmond, Pulitzer Prize-winning author of Evicted (see my review here), goes farther than Reid and claims that the MID is greatly exacerbating American inequality. His NYT article of May 9, “How Home Ownership Became the Engine of American Inequality,” details the cases of four homeowners and three renters in various American locales. Desmond calls the MID “public housing for the rich.” That’s not all: “A 15-story public housing tower and a mortgaged suburban home are both government-subsidized, but only one looks (and feels) that way. It is only by recognizing this fact that we can begin to understand why there is so much poverty in the United States today.” Desmond’s work is provocative and well worth reading. Reid says that 175 of the planet’s 200 countries employ some version of a value added tax (VAT). Essentially a sales tax on consumption, the VAT is applied to every stage of commercial production, not just to the final sale in a retail store. Two advantages emerge: there is less incentive to evade the tax for producers, and its collection is more steady. That it tends to be a regressive tax is its main disadvantage. While praising its potential simplicity, Reid rejects the flat tax outright. He says it can work in countries where a polarity of income doesn’t exist (like the former Russian satellites in the last half of the twentieth century), but not in highly unequal societies like the United States. The flat tax takes in precious little income, and it further increases inequality. Slovakia and the Czech Republic initially utilized the flat tax but them dumped it as an oligarchy class gained prominence. Reid additionally suggests that the US corporate tax rate be lowered (which would help deflate the current rampant incentive to avoid the tax), that our very richest citizens be taxed progressively, and that a financial transactions tax be implemented on Wall Street. He also says increasing the gasoline tax is a no brainer that can easily help bolster sagging US infrastructure. Mr. Trump’s Treasury Secretary, Steven Mnuchin, has said the administration is confident that it can create a new tax plan that “pays for itself” with economic growth. Flat taxers, like Grover Norquist and Ted Cruz, spout the same type of fervor – that tax breaks will unleash economic growth like never before. This type of dogmatism has dutifully entered the realm of bogus cliché. The days of robust growth are over – see my five-part blog series on Robert Gordon’s The Rise and Fall of American Growth – and it’s time for Americans to hold political leaders accountable to a responsible and sustainable understanding of economic development. How a country structures its taxes matters for inequality, economic development, and social spirit – all these included in an understanding of common good. In the earliest days of federal income taxation, “the ability to pay” was recognized by Woodrow Wilson and Franklin Roosevelt as a patriotic duty of the economically advantaged. The tax also helped America maintain some sense of egalitarianism. Today, with a federal poverty rate of 13.5 percent, the majority of Americans can claim status as economically advantaged. Taxes are what we pay for a civilized society – a tax code that is simplified, more equitable, broader-based, and progressive toward the top can help this society recover some much needed civility. People who are not doing well economically in the United States – are they at fault or are they trapped in a system with little opportunity of moving forward? This has been a pertinent question and conversation point in the United States for generations back to the Gilded Age and the Depression ongoing to the current era of inequality. Matthew Desmond is a Harvard sociologist and urban ethnographer. He’s not a blue blood; born at the dawn of the current era of inequality (circa 1980), he went to college with his parents’ encouragement but not their financial backing. While Desmond was in college, his working class parents were not able to keep up with mortgage payments and a bank foreclosed on their home in Winslow, Arizona – the home in which Desmond grew up. It became a defining moment in his educational and vocational journey. Desmond treats poverty as existing, not in a vacuum, but in a people-to-people relationship system where influences run much more varied than simple one directional causes-and-effects. For the project that produced the book Evicted, Desmond moved into a lower-income Milwaukee trailer park in May 2008. He lived there four months and then moved into a rooming house on the second floor of a duplex in Milwaukee’s predominantly African-American North Side neighborhood. He lived there until June 2009. (This is the same part of the city that saw violent unrest in August 2016 after the fatal police shooting of Sylville Smith, a twenty-three-year-old African-American.) Evicted details the lives of eight lower-income families Desmond got to know during the fourteen months he lived in Milwaukee. Some of the families are white, some are black; some with children and others without children. What they all share in common: evictions from their living quarters. According to Desmond, the majority of Americans living in poverty spend over half their income on housing, with one in four Americans spending more than 70 percent of their monthly income on housing and the electricity bill. It’s hard to stay put when there’s more month than income. One in eight Milwaukee families experienced eviction during 2009-2011. Desmond takes his readers to eviction court – a well-lubed machine in Milwaukee (and other large US cities) involving landlords, judges, sheriff deputies, moving companies, and belongings dumped onto the street curb. Desmond writes well. The first chapter describes Milwaukee’s formidable winter “as cold and grey as a mechanic’s wrench.” Read on and you’ll discover that he also researches well. His meticulous transcribing of recorded conversations and note-taking yielded more than 5,000 handwritten pages from which to tell this crucial and important American story of poverty. Evicted joins a recent chorus of work (Barbara Ehrenreich’s Nickel and Dimed, Bill Bishop’s The Big Sort, Linda Tirado’s Hand to Mouth, among others) that documents the lack of knowledge that exists in upper- and middle-class America about their fellows who live in poverty. Since the advent of the current era of excess and inequality beginning in 1980, America has emphasized fiscal over social policy. We’ve figured out how the rich can get richer and what makes the stock market rocket upward. We’ve fallen behind, however, in compassion and understanding. Desmond doesn’t write himself into the story. In the Epilogue (the only part of the book where he uses his first person singular voice), he asks readers when telling others of this work not to focus on him but upon the characters in the story: Scott, Pam, Sherrena, Arleen, Vannetta, Tobin and the others. I’ve strayed from Desmond’s request in this review. I can’t give, however, a stronger recommendation for this book – bump it up to the top of your to-read list, now. Evicted is must-reading for any and all concerned about poverty and inequality in American society and for those wanting to go beyond simple suppositions about their neighbors living in poverty. Desmond, Matthew – Evicted: Poverty and Profit in the American City (Crown, 2016).